Music Copyist | Richard Altenbach, composer, violinist. Turn your original handwritten compositions into professional print form ready for publication! We work with simple lead sheets or fully orchestrated scores. Price includes lyrics, dynamics, phrasing, tempo markings, chords, articulations, rehearsal markings and one set of revisions. Subsequent revisions charged at $50 / hour. One page handwritten score typically equates to one page of notated score. 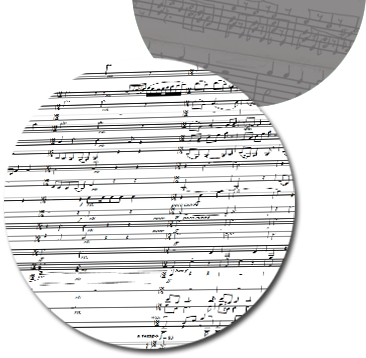 Need a MIDI or audio recording to be transcribed into music notation? We listen intently to your music and put it down into written form. The music is then rendered into beautiful, readable print! Pricing starts at $20 per 30-second recorded increments for a single staff instrument. Send mp3’s, YouTube videos, CD’s or tapes. Are you a song-writer needing an expanded string orchestra version of your music? or maybe a piano reduction? Are you a performer requiring an existing piece of music to be transposed to a different key? We can provide you with the modified arrangement to meet your needs. Click for Sample – Richard’s arrangement (in MIDI) of the beloved song “Con Te Partirò” sung by Richard’s beautiful wife Dawn Simmons. or call Richard at 310.403.0611. We are eager to share our professional services and learn how we can help meet your creative goals!